Thanks to Dr. Ahmed Lazim, Al-Jumhori Teaching Hospital, Mosul (Iraq), for contributing this case. To contribute a Case of the Week, follow the guidelines on our Case of the Week page. 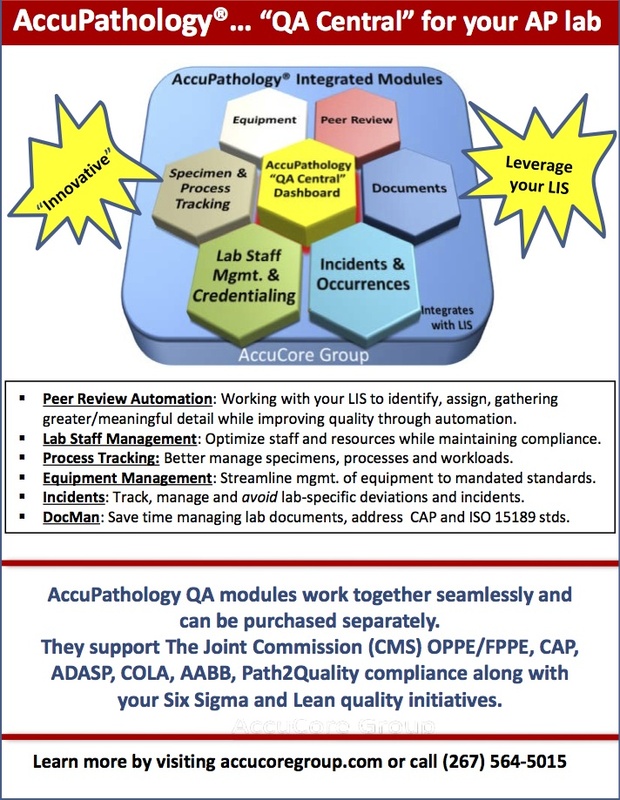 (1) Thanks to all who stopped by our booth at the USCAP meeting in Baltimore. We received many suggestions and signed up many reviewers, which we hope will make the website even more valuable to the Pathology community. If you have any comments or suggestions on making PathologyOutlines.com more useful to you, please let us know. (2) Many of the Modern Pathology links are not working, due to an IT problem apparently on their end - we have contacted them and are working on the problem. A 2 year old boy presented with a history of trauma 2 months previously. 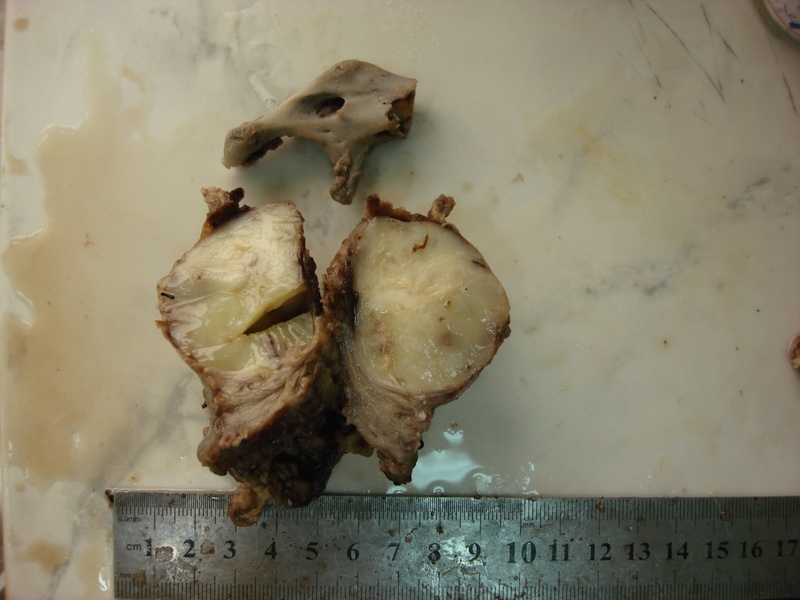 Ultrasound revealed a hematoma-like mass at the zygomatic bone, but one month later, the mass had enlarged to 7 cm. 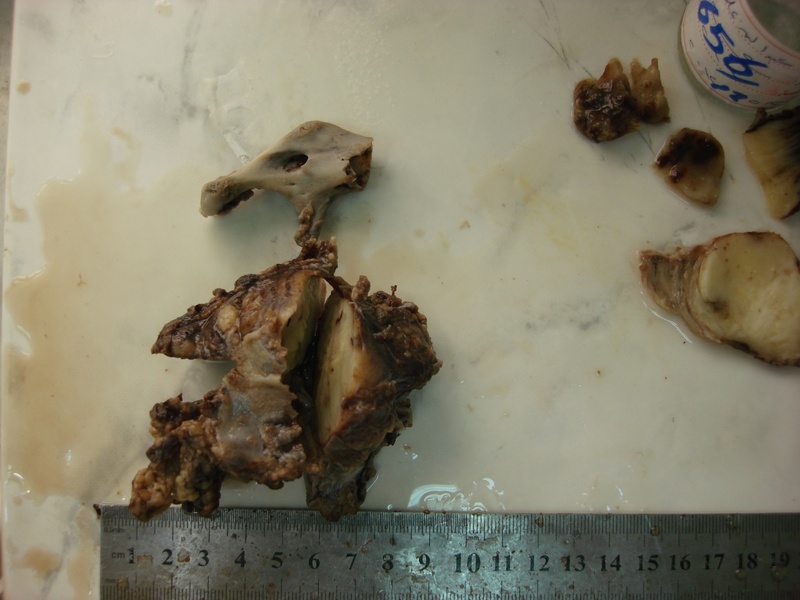 Excision revealed a 700 gram, 9 x 6 x 4.5 cm specimen of a nodular mass with parotid gland, 2 lymph nodes and a fragment of zygomatic bone. 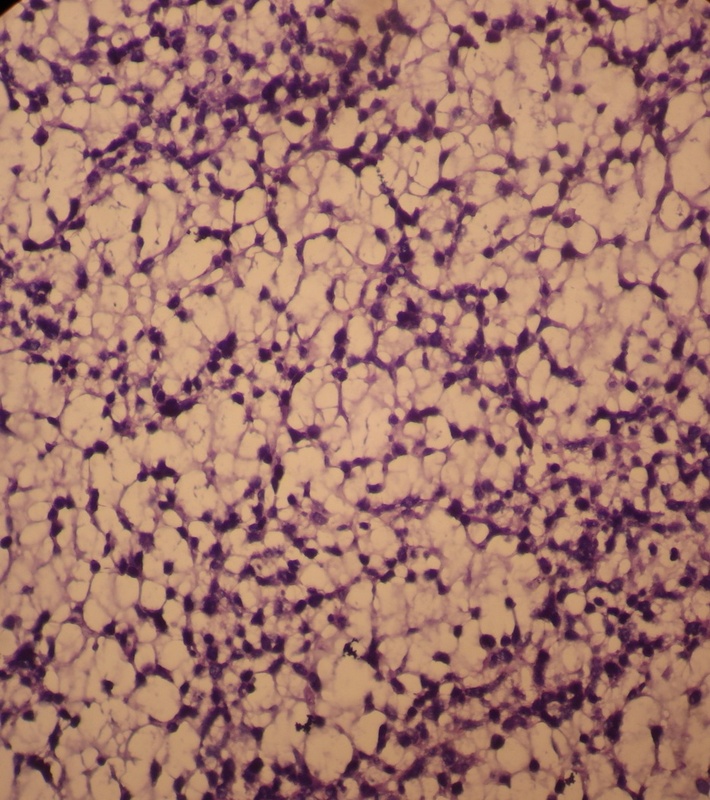 Embryonal rhabdomyosarcoma is a primitive soft tissue sarcoma with small blue cells resembling embryonic skeletal muscle. 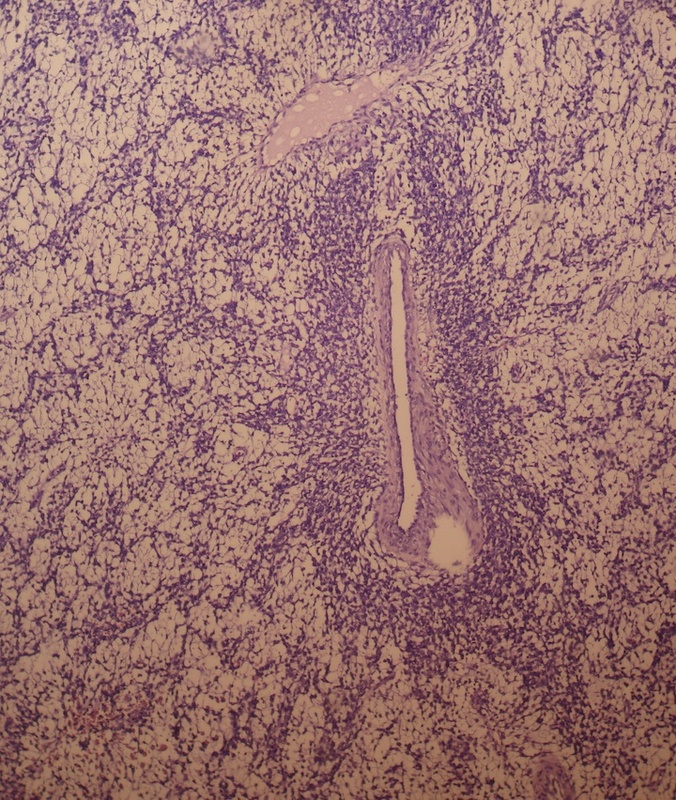 It is the most common rhabdomyosarcoma (RMS) subtype (65% of RMS cases), and usually occurs in children ages 3-10 years in the head and neck (nasal and oral cavities, orbit, ear), prostate or paratesticular regions. 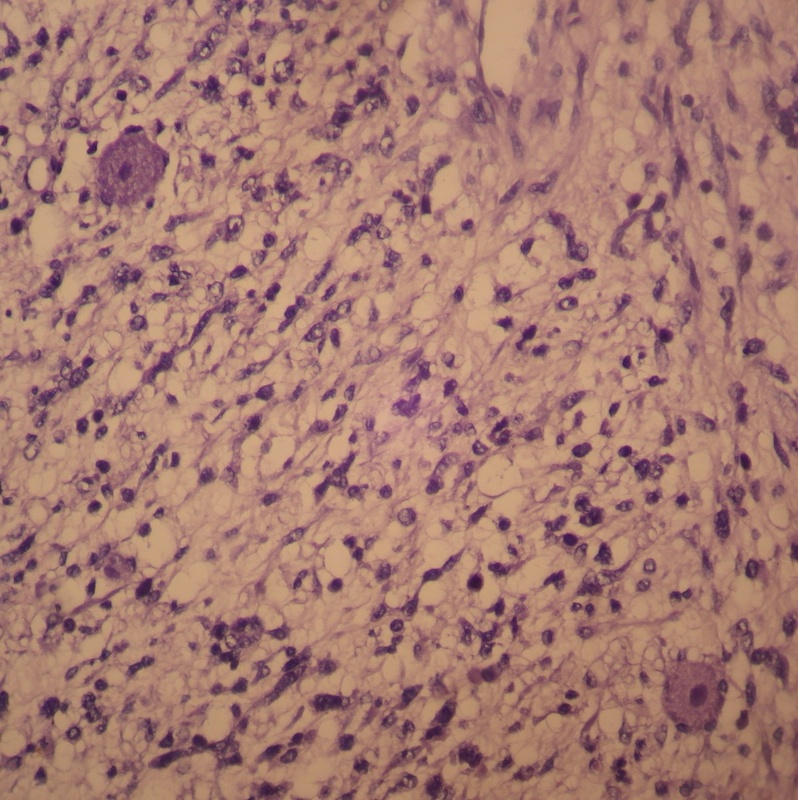 Gangliorhabdomyosarcoma is a rare variant of embryonal rhabdomyosarcoma which also has cells exhibiting neuronal differentiation (Histopathology 1986;10:181). 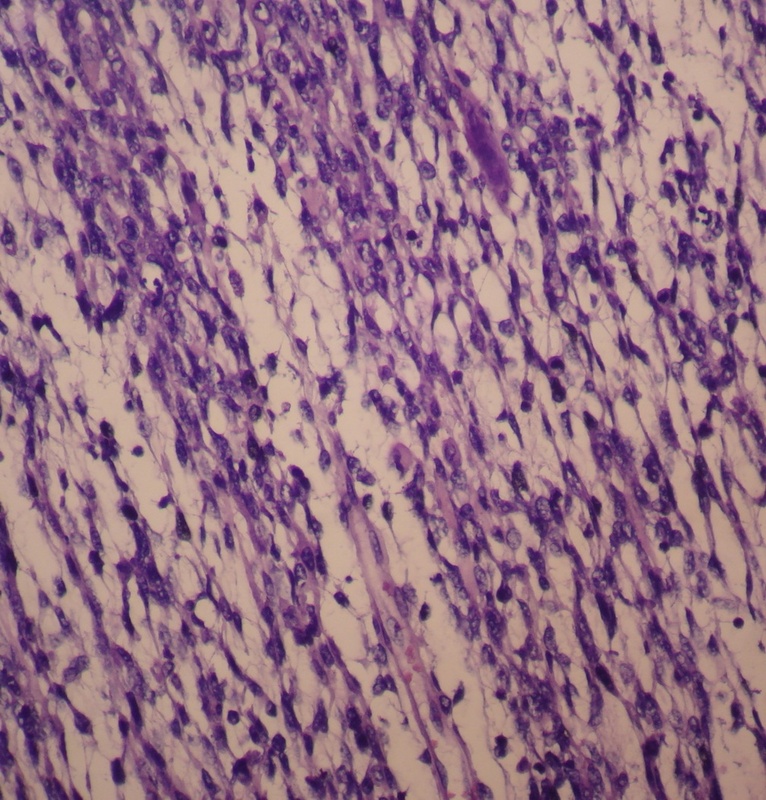 A related entity is malignant ectomesenchymoma (Cancer 1987;59:1791, J Cancer Res Ther 2012;8:465), composed of a malignant mesenchymal component (often but not exclusively rhabdomyosarcoma) and a neuroectodermal component (often ganglion cells or neuroblasts). 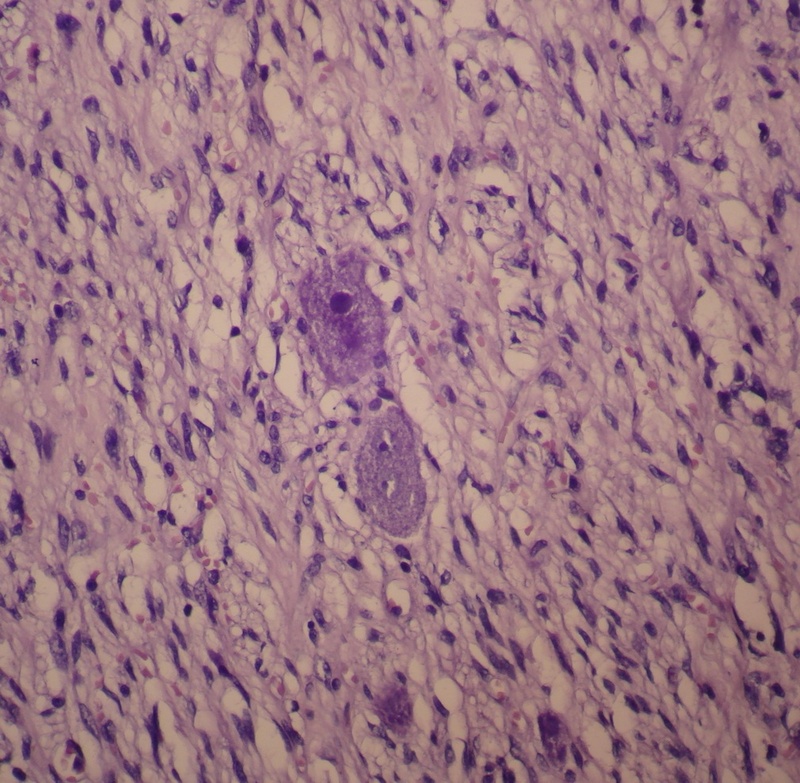 The differential diagnosis includes Triton tumor (rhabdomyosarcoma plus MPNST), Wilms tumor and teratoma. 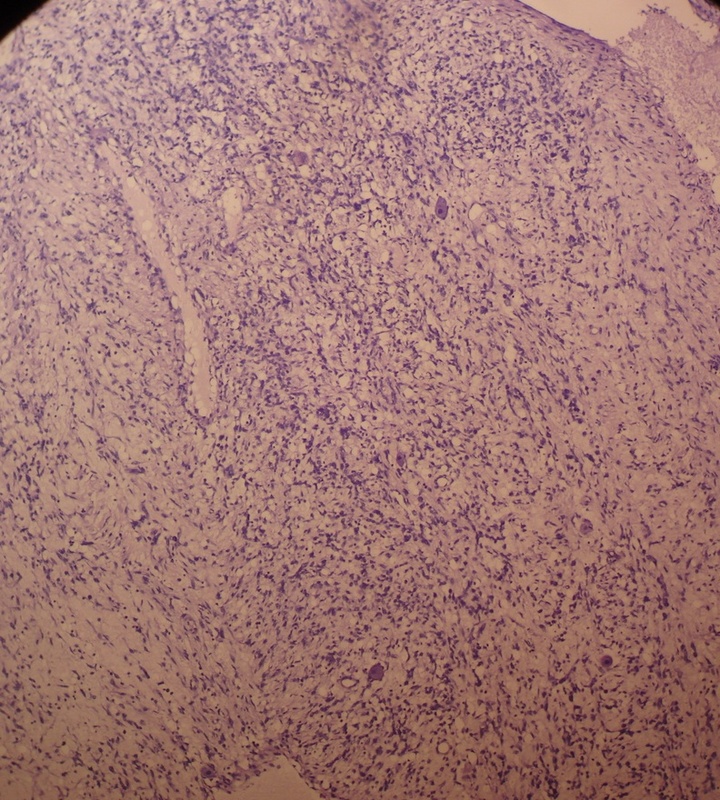 Optimal treatment is not well defined for this rare tumor, but most authors recommend a combination of surgery, radiotherapy, and a chemotherapeutic protocol based on the RMS component (Indian J Med Paediatr Oncol 2011;32:242).